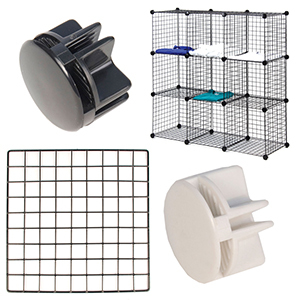 Black, Mini Grid, 14" x 14"
White, Mini Grid, 14" x 14"
Mini Grid Panels are great options to highlight merchandise in a unique, attractive fashion! Mini Grid Panels are versatile and can be made into cubes. The Panels come in 14" x 14" squares for this mini grid. To assemble, use the 12 way and 8 way connectors to make a variety of displays for your retail store. Available in Black, White, Red, or Chrome colors. Also, you can use the clear acrylic shelf plates and Slatwall & Gridwall wire shelves for Mini Grid. These plates are made of 1/8" clear acrylic and come in 14 x 14 and 24 x 12 sizes.